I find it very difficult not to return to the Philippines. This is going to be the fourth time now in a span of just a few years. The place just has SO MUCH to offer. Before moving to California, I lived there for over a decade… yet only now do I realize how much of these islands I haven’t experienced yet. Some of the best beaches in the world are found right here, in the Pearl of the Orient Seas. The first time I went back was after almost 9 years of being away from my Motherland. I pretty much just kept it local to Manila, except for a quick trip to my old university in Los Baños, Laguna. I met up with relatives and old friends, not really doing much in the way of sight-seeing. But it was that first trip that sparked a curiosity in me. To the Westerners, you will find that the cost of living there, the prices of locally made goods, as well as that of labor and service to be very affordable. This makes Geo-Arbitration a very potent and efficient way to stretch your money. The efforts put towards earning Dollars or Euros but choosing to spend them as Pesos allows you get a lot more out of it. As a broad generalization, think of always being able to get about 50% off on the things you normally buy; That Happy Meal your kids bug you about, the monthly deep tissue massage at the mall, your weekly groceries, and don’t even get me started on housing rent or mortgage… It was this initial trip back to that breathtaking group of Pacific Islands that brought these facts to the front page of my mind. And it wasn’t like I didn’t already expect prices to be cheaper, but there I was bewildered with the fact that I could take a trip there with a couple thousand bucks, drink, eat and party like a king and still fly back to California with a third of my pocket money left untouched. During that first trip, before even setting foot out of the country, I had already made up my mind on when the next Philippines trip would be. It was in part to attend my best friend’s wedding, but also to satiate my lust for adventure, that I set my sights on the target. The legendary Palawan: A truly wild and green part of the Philippines that kept me living in the moment. What a delightful expedition that turned out to be! During this time my good friend and brother, NWA, cast off his chains and lived up to his code name: Never Winter Again. He is now living in the Philippines full time while taking full advantage of Geo-Arbitration. I admit, I am very jealous of his situation and am constantly striving to achieve a similar lifestyle. A journey which I use this blog to document. What he was able to pull off is a big inspiration that has guided me to my current belief system. It was some time after my second trip that he spoke to me of “A diamond in the rough,” -his exact words. I made it a mission to go there and see this island called Camiguin (kah-mi-GEEN) with my own eyes and share it with you here. Camiguin is one of the smaller islands in the Philippines but is considered its own province. It is divided into 5 municipalities, with the largest, Mambajao (mam-bah-HOW) serving as the provincial seat where it’s governor takes office. Due to it being located right off the northern coast of the second largest island in the Philippine archipelago which is Mindanao, Camiguin is technically part of the Mindanao Region and not in the Visayas, at least politically speaking. It has a round shape and is often imagined by the locals to look like the delicious lanzones fruits for which it is nationally well known to produce. Heck, the culture there is so tied to the fruit, they even have lanzones festivals to celebrate the harvest season. If you’ve never seen one before, the lanzones is a small, spherical, yellow fruit that grows in bunches on a type of mahogany tree. The fruit itself has a thin skin that you can easily peel off to get to the edible part. Watch out for the seeds, they’re bitter if you bite into them. Normally, lanzones have a sour zing to them however the ones I’ve tasted from this island have a much sweeter tickle to my taste buds… which is perhaps due to the nutrient rich volcanic soil they grow on. Speaking of volcanoes, Camiguin has 7 of them! That’s right, SEVEN. The last recorded eruption was back in 1951, which killed about 3,000 people with pyroclastic lava flows and poisonous gases. Something about that fact still gives me a tinge of adrenalin rush when I think of it… The entire time I was there, at the corner of my mind lofted the fact that I could very suddenly find myself in hot water (literally!) at anytime. I came across several tourist guides that referred to place as “the Island born of Fire,” I also found out that this was one of the few provinces that had a dedicated outpost and research station operated by PHIVOLCS, the national entity that monitors volcanic activity. To me, both were subtle reminders of how short life is, cementing in my mind why the lifestyle path I’ve chosen to take, that of living in each moment, is thus far the correct decision. NWA had a lot of good things to say about the place and having been there ahead of me, he had made some connections with locals. 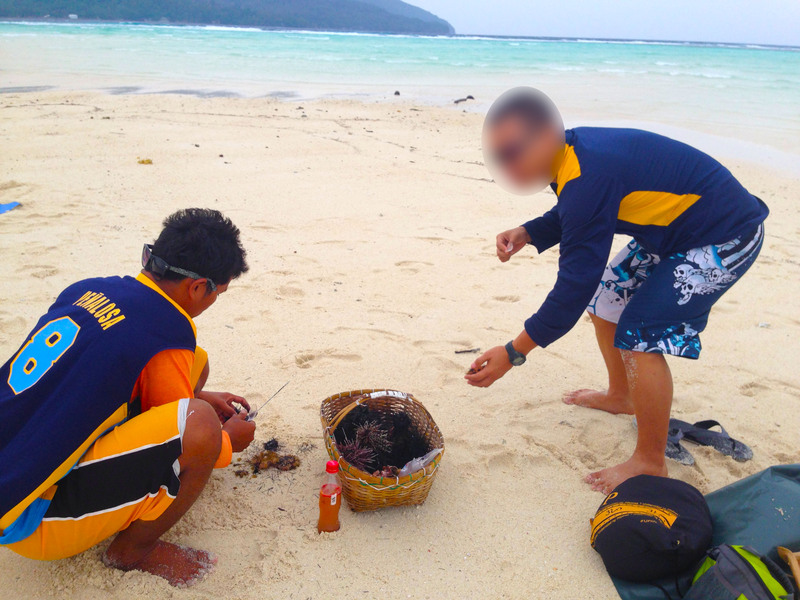 To my surprise, he said a good number of foreigners had decided to settle in Camiguin. I sought out to answer my question of why; what made this place so settle-down-worthy? 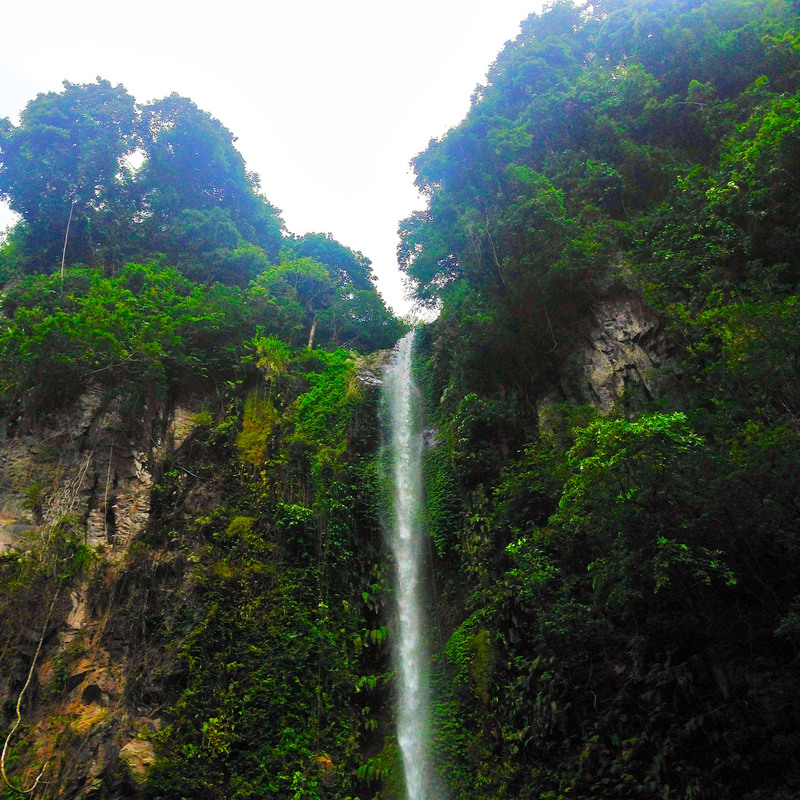 We planned to take a quick jaunt over to Camiguin during the latter part of my third ‘Pinas trip (The affectionate nickname is comes from Pilipinas which is what we Filipinos call our country.) We took a Cebu Pacific flight from Manila to Cagayan de Oro, the most urban area in Misamis Oriental which is the nearest province in northern Mindanao to our destination. After arrival, you have several options. We took a 2 hour shuttle van ride to a ferry terminal still further north of the province and traveled by ferry for about an hour to one of three ports of entry, this one being Benoni, in southeastern Camiguin. In hindsight, it turned out to be a mistake since the more time-efficient way would have been to take a flight to Cebu and make a connecting flight to the small airport in Mambajao. Ah well, as my uncle always said: charge it to experience. NWA, helped plan the details of the trip. He brought along with us, his girlfriend (we’ll call her Maya) and her friend whom she used to work with, let’s give her the code name Inday (in-DIE,) both of whom proved to be such sweethearts during the trip and were representative of the compassionate and caring nature which epitomize the Filipina character. Inday was born in Camiguin and was eager to revisit her family and she was to be our guide and translator. Even though a good number of the locals could speak English and Tagalog (Filipino) it’s still very useful to have someone who could speak the local dialect. If anything, as a good way to haggle or negotiate for good deals. It caught me off-guard that Maya and Inday had never been on-board an airplane before. Having been in the air as early as I was three months old, it was easy for me to take something like an hour-and-a-half flight for granted. The mixed excitement and apprehension in their eyes gave me a glimpse into what it must be like to, for the first time, find yourself in a fragile can of metal and plastic and be thousands of feet in the air as you are propelled forward by aviation science. 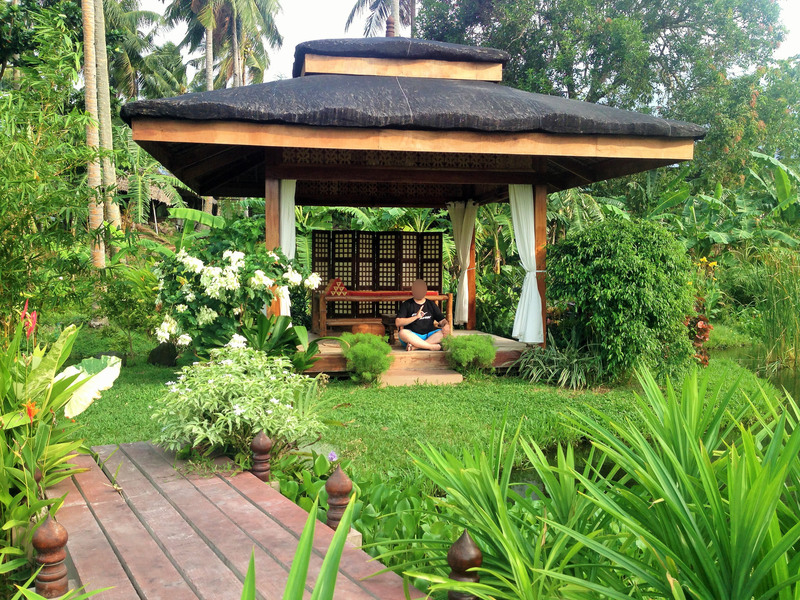 I chatted with Inday to ease her mind. It turns out that she had left her province a couple of years ago for the allure of the career opportunities in Manila. This is a very familiar story to most Filipinos, as there are many who set out to the big city to seek out their fortunes. Personally, I think it’s a mistake for everyone to crowd into the capital when there are so many other places in the country that could use development from the enterprising and ambitious provincial. This sort of Centralization mentality can have it’s uses, but the glaring disadvantage is that it keeps the poverty line at status quo. Aaaanyhow… that’s a conversation for another time. Once we set foot on the island, we were picked up by a shuttle van courtesy of the resort we were booked to stay at, a place called Dayon sa Cabuan. We embarked upon Camiguin’s main artery of transportation which is called the Circumferential Road because it encircles the entire island along its coast. Shocking. I know. It took about 30 minutes to traverse there from the port. Upon arriving, we found it to be a modest resort, very easy on the pocket and had great service. It sprawled over a rather large strand with a lawn that led to the coast. There was a simple wooden fishing pier that jutted out to the relaxed waters. The fruit trees that dotted the resort swayed to the calm sea breeze. Rooms were in separate housing that were spaced apart from each other for ample privacy. We set our belongings down and asked the driver to drop us off to meet a college friend of NWA’s who lived nearby. The meeting place was at a local open air bar, known as the Northern Lights. It was a gorgeous little place. We were greeted by Paul who met us at entrance to the charming restaurant/bar (commonly called “resto-bars.”) He was somewhat popular around town and had a long family history tied to the island. It turns out that he and Inday knew of each other. Ahhh, talk about the simple life on the small island where the people are pleasant and nice. Imagine that! I was slowly beginning to see why foreigners were opting to settle down here. After feasting on good food and a few drinks, Paul drove us to the middle of the provincial capitol for some souvenir shopping. We got to finally taste another enjoyable edible that Camiguin is well known for, the heavenly pastry called Pastel. Pastel de Camiguin, is a bun baked with yema filling which is a sweet derivative of egg yolk. It’s history goes back more than a century ago with the birth of its creator, Agrepina Gultiano who turned it into a successful commercial business. Today, the pastries are filled with authentic Filipino flavors such as Ube (purple yam), Makapuno (a sweet product of coconut flesh) or Leche Flan (baked custard), and now you can even try strawberry and mocha flavored Pastel. Though I still think nothing beats the original yema filling. Each of us loaded up on boxes of Pastel and along with our lanzones in tow, we would randomly snack on them for the rest of our stay. NWA and I got into the habit of taking bites out of the Pastel bun until we’ve eaten most of the bread and all that’s left is pretty much the yema filling. Saving the sweetest part for last, we’d would drown out our palettes with these overpowering flavors! It’s in line with one of our guiding principles in life: Work hard, play hard. *ahem* … Paul then drove us up into the volcanoes and tropical jungles towards one of the tourist attractions there, Katibawasan Falls. We parked along a gravel lot surrounded by souvenir stalls. Paul bought a local treat for all of us. The name escapes me right now, but I think it was called kiping. It was a crunchy type of hard wafer that was shaped like a bowl or plate. Sweet, chocolate-y syrup is sprinkled over it. Be careful as you walk up the path to the water falls, a brood of hungry chickens will follow you around hoping to have a peck of your delicious kiping! Pesky chickens. The kiping is mine! After a short stroll up the hill, we looked down towards a majestic pool that collected the cold mountain waters. The view was spectacular. We made our way down cautiously while making sure the chicken assault team stopped following us (they did.) NWA immediately checked in to the cool pond and stepped under the thunderous falls to shower. Looking up from the pool, the mountains and trees encircled us as if we were gladiators in an arena and they were the spectators. The girls and I took the mandatory photos posing by the waterfalls. Maya, despite her absurd fear of sea monsters, decided to brave the pool with her boyfriend. She cautiously stepped in and was feeling the waterbed with her feet for anything alarmingly weird. NWA held her hand as he gallantly led her deeper. I really did not expect her fear to expand the borders of irrationality, so I jokingly called out to her “No need to fear [Maya], there are no sharks here. Sharks are afraid of crocodiles…” It took only a split second for her to go crazier than a sack of bees. She hopped on NWA’s back and cried out as she flailed about with one hand while the other covered his vision. I felt so bad after the initial chuckles wore off. Note to self: Don’t joke to Maya about sea creatures lest someone loses an eye. Again we feasted in the abundant local food. The laughter and merriment were thick in the air around us as the local kids, Inday’s brothers, sisters and their cousins and friends fed their curiosity at the sight of their visitors. We chatted with her parents, who were farmers and caretakers of the local land. Theirs was a simple, happy life far removed from the smart phone obsession and social media frenzy the rest of us were up to our eyeballs in. It was very refreshing to escape the complexities of urban living, even for a little while. With full stomachs we said our goodbyes and left Inday to spend the night with her family. Paul picked us up a short while later right by the paved road, the night was not over yet. Casa Roca was an exquisite bed and breakfast, an island mansion nestled upon the wave-stopping cliffs. We found ourselves in the resto-bar that lounged from the front door on the main floor of the mansion to the open air courtyard outside. We were warmly welcomed by the owners, Jim and Evelyn whom Paul knew and NWA had previously already met. Jim was a Canadian expat who resided there with his lovely fiancé, Evelyn. By the time of this writing, the two lovebirds have since gotten married (Congratulations!) Evelyn excitedly gave us the grand tour of the upstairs where all the rooms were nestled. The master bedroom was like a picture torn out from the front cover of some ultimate romance novel. Tropical style ceiling fans made of rattan, pearly-white veils draped over the king sized bed, open air windows inhaling the fresh sea air. I think I’ll stay here next time and bring some company. We sat by the table where Jim and Evelyn were entertaining an American expat and began to socialize. The cold beer was a perfect compliment to our earlier food fest while we traded stories. NWA held one of Jim’s guitars and Paul and I chatted with the American who lived in the city of Cagayan de Oro (CDO) with his Filipina wife but had a standing agreement that he would visit Camiguin for a week out of every month for relaxation. That seemed to be the theme around here with the men and women. Paul was no exception as his wife would similarly crave the urban setting and trek out to CDO every now and then for a shopping mall run. Do majority of men seek out simplicity and majority of women, excitement? It certainly seems so to me, now more than ever. Next thing I know, my head was swimming in beer and we laid down to sleep for a bit back in the resort where Paul dropped us off at. He’d return the following morning. We got up early to maximize our last day, NWA and I had a motto to live up to: No Rest, No Shame. Inday came by to the resort after staying the night with her family and soon we were off to our first stop, White Island. If Camiguin were to ever be compared to a planet, it would have been like Mars who had two satellite moons. White Island being one of them, was so called because it was a sand bar composed entirely of strikingly white sand and shells. It was about a thirty minute boat ride off the shores of Camiguin. The boat operator would drop us off there along with the other tourist for about an hour while we walked around, took pictures, and had a picnic. They would return a few times to shuttle over other tourists and take us back when we were ready. One thing the city slicker should keep in mind about island life, is that schedules here are not set in stone. NWA and Maya took pictures by the beach and enjoyed the warm pacific waves. Paul, Inday and I laid down our beach towels and snacked on Pastel and Lanzones. Shortly after, a vendor came up to us selling sea urchin. (I know, right?!) They dove into the nearby waters and would harvest them, selling three for about 50 Pesos. Now, since I’m the type of guy that is very adventurous with food, I’ll try anything at least once and so I bit in. The vendor took one of the sea urchins from his wicker basket. They had a variety of dark colors. Some black, some grey and some even purple. He would carefully lay them on the beach and as if they knew they’d be eaten soon, they would try to slowly roll away by moving their spines. The vendor would chop off the spines so that they could be held more easily and he would crack them open like an egg. The hollow insides of a sea urchin have a trail of yellow sand-like goop in the shape of an asterisk with five points. It is precisely those yellow innards that is scooped up with a plastic spoon. If you frequent a sushi bar, you will recognize it as the edible sand grain looking substance that the Japanese call Uni. The difference here is that this is fresh off the sea and the vendor offers to add some vinegar to neutralize the briny taste. It was weird holding half the “shell” of the sea urchin, sort of like a cup, to scoop up the edible part soaked in vinegar. I could feel the rest of the chopped spines wiggling in my palm. If you are squeamish, please know that I wasn’t trying to gross you out… It was just such a unique “dining” experience that I’m always eager to try out and share. Even the girls sucked it up and courageously tried some uni. 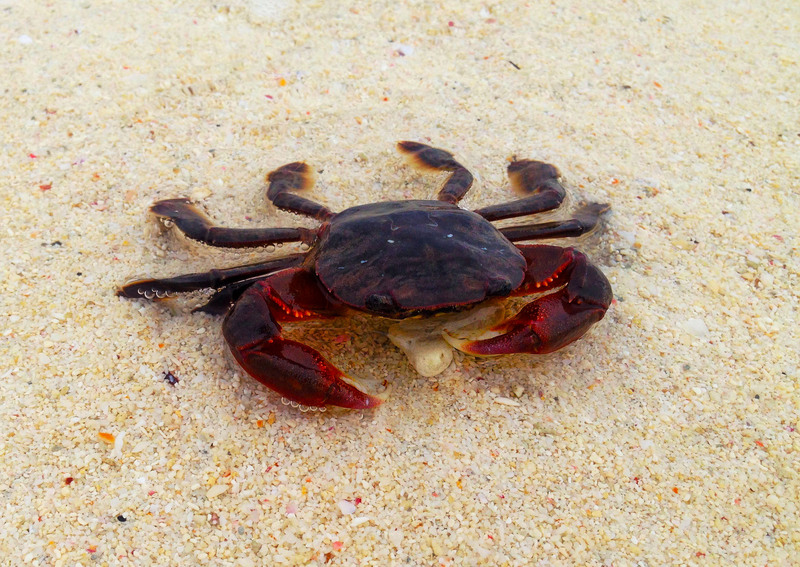 Before departing, I walked the stretch of the island and took a picture of some of the locals. 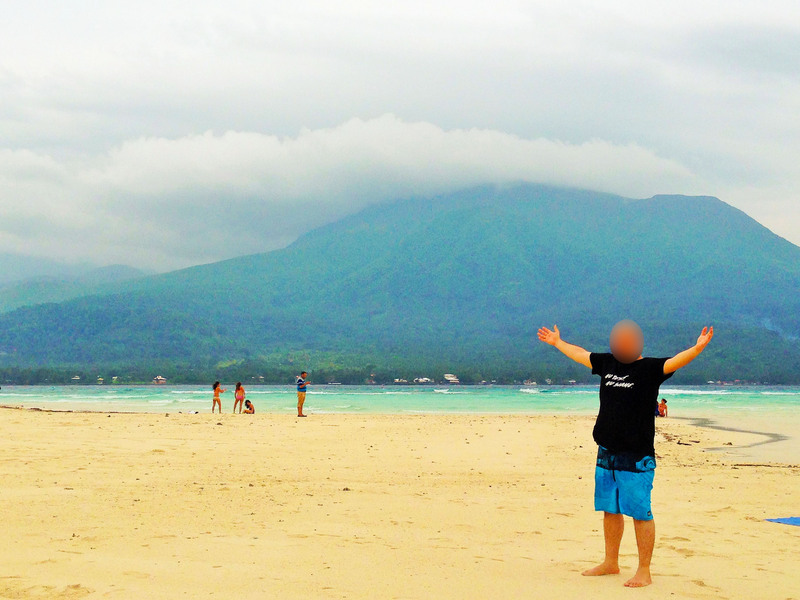 Standing on the white beach, the back drop of the Camiguin volcanoes and the waves in between were a Facebook worthy cover photo. On the way to the next tourist stop, Paul took us to his home to pick up his kids. They were very excited to join us for a play day at the beach. He introduced us to all three of them plus one of their cousins. They were very well behaved and so charming. As they got their gear ready, Paul showed off some of his wood working skills, a sofa and a bed that he made with his own hands. At this point in our adventure, I was still not satisfied with the white sand we’d seen so far. My fetish for all things white seems to extend, not just to white chocolate and white women, but to friggin’ sand as well. Having been to Palawan the year before and marveling at El Nido’s gorgeous islets surrounded by the light yellow beaches, I was beginning to get disappointed with Camiguin’s drab, dirt-brown shores during our first day. But fortunately, there was another island nearby that would satiate my lust for everything alabaster. Mantigue (man-TEE-geh) was a fair sized circular island which you could walk in about thirty minutes around back to the point you started from. From our earlier Camiguin-Mars analogy, Mantigue would be the other “moon” just to the southeast of her mother island. 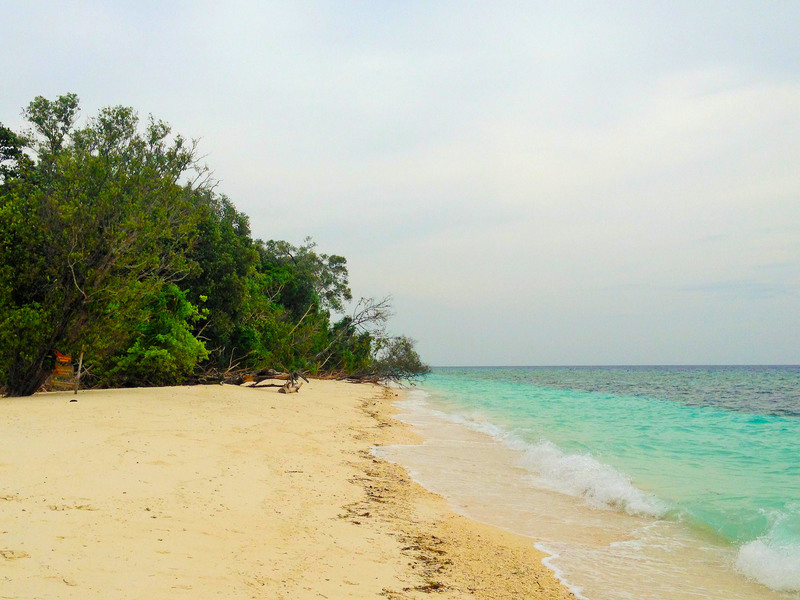 The beach was as white as the previous sand bar and there was a jungle of sorts in the middle. 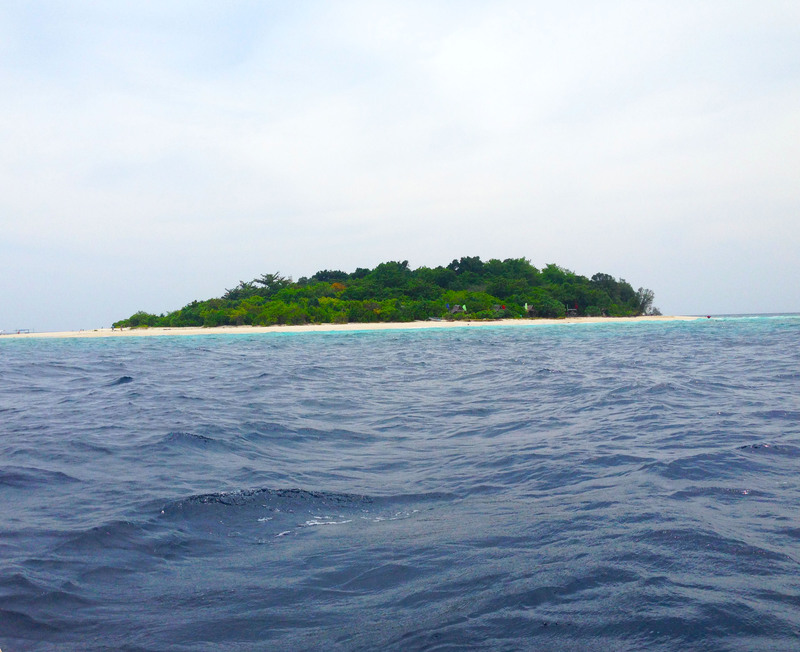 It was the kind of deserted island you’d dream about getting stranded on… except… well, it’s not exactly deserted. On the eastern side of the island are some transients that have settled there, building a small community of huts. From what I understand, they are typhoon victims from another island called Bohol, further north. 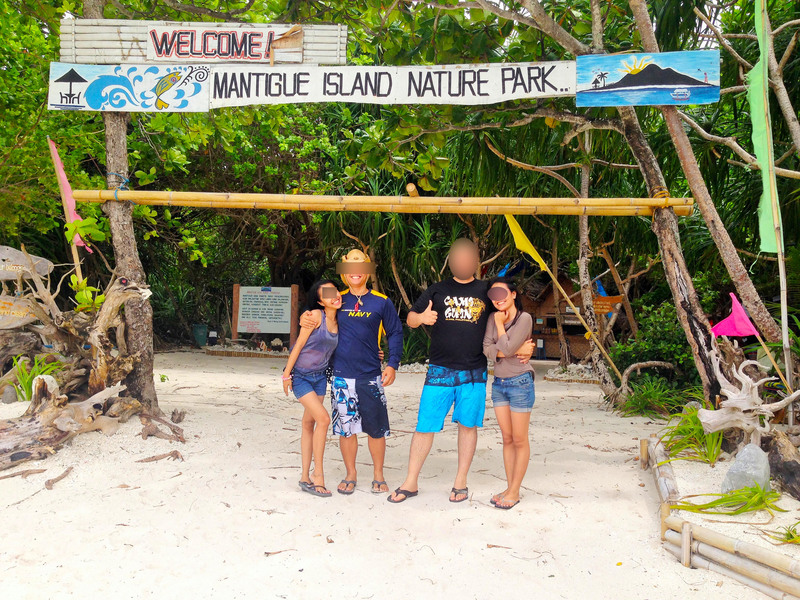 Mantigue Island is a nature park of sorts, with a bridge-path through the jungles and plenty of coral preservation around it where divers could explore. After diving into the warm embrace of the aqua blue clear waters, Paul let loose the kids who were eager to join in with us. The waves were very welcoming and after about a half-hour we walked back and sat on the picnic benches where our food was prepared for us. Pork and fish with rice, prepared right on the island. After chowing down and stuffing my face, I laid down on one of the benches and took a nap while the others explored the vegetation inland and took a holy-sh*t-that’s-a-ton-of-photos with my phone. As for the nap, oh, how it was glorious. I relaxed into a smile as I tucked away all those office day memories in some closet at the farthest corner of my thoughts. The time to leave was nearly upon us. We decided to take the second to the last ferry out of Camiguin. A very prudent course of action given how the locals view time and schedules as not something that is constant which has to be adhered to, rather, something that is lucid and flowing like the palm trees in the wind. When someone tells you that the ferry will leave at 3:00 o’clock, allow a thirty minute change in the schedule to occur before or after… Probably after. As we waited for the ferry, we dined at the nearby J & A Fishpen Restaurant. They have floating huts interconnected by wooden bridges that wallow over their fishpens. The sea food was very fresh and delicious. 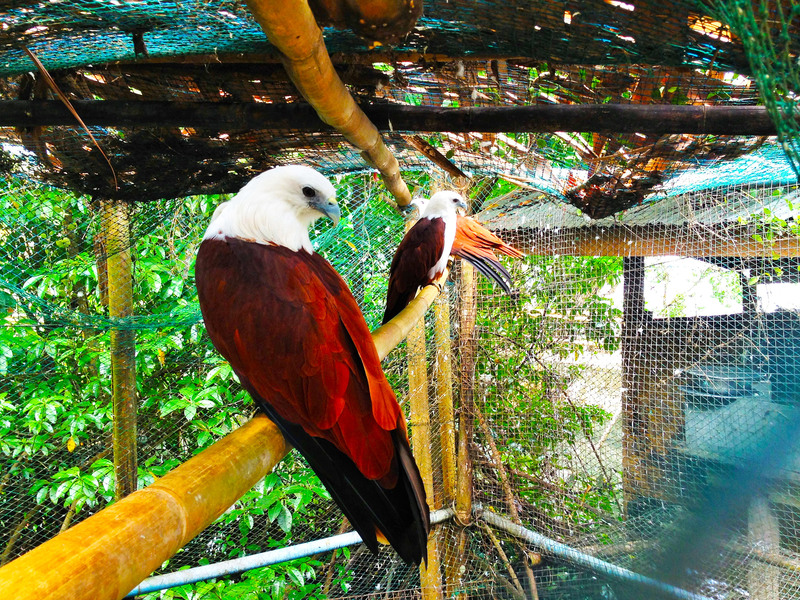 They also had aviaries where hawk-like birds-of-prey know as “kites” were perched. Which meant, you guessed it, mandatory picture taking. I really can’t help it.